(Milton, DE) - Over the next few weeks, the tart and complex Ancient Ale Kvasir will be hitting taps and shelves. The recipe for Kvasir (say va-SEER) was developed with the help of chemical, botanical and pollen evidence taken from a 3,500-year-old Danish drinking vessel. The vessel, made of birch bark, was found in the tomb of a leather-clad dancer or priestess. "Last year, we brewed an Ancient Ale from southern Europe," says Dogfish Head Founder and President Sam Calagione, "so it's been interesting to see the differences driven by the Scandinavian climate and terroir." The analysis, done with biomolecular archaeologist Dr. Patrick McGovern, pointed to the ingredients Dogfish uses in this unique new brew: wheat, lingonberries, cranberries, myrica gale, yarrow, honey and birch syrup. "I'm psyched about doing this Nordic grog," says Dr. Pat. "We're bringing back to life an innovation of our prehistoric ancestors at the most northerly limits of the planet." 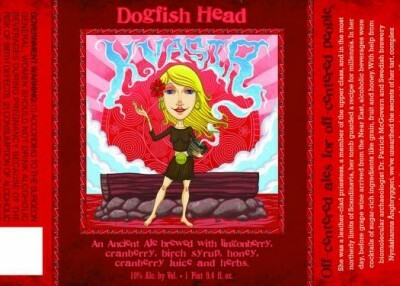 Kvasir, which clocks in at 10% ABV, will be available on draft and in 750-ml bottles throughout Dogfish Head's 27- state distribution network, in accordance with local laws. To find retailers who have received shipments in the past 60 days, try Dogfish Head’s “Fish Finder” app at www.dogfish.com.